Huanglongbing (HLB), greening and yellow shoot are names for the most devastating citrus disease in the world. Symptoms of HLB include a distinctive chlorotic mottle on fully expanded leaves. Infected shoots are stunted, and branches gradually die back as the symptoms appear in other sectors of the tree canopy. HLB reduces fruit size, weight and other fruit-quality variables, such as total soluble solids (TSS) content, acidity and TSS/acidity ratio. In Florida, HLB incidence is approaching 100 percent infected trees, except in groves less than 5 years old. The Florida orange forecast, at 67 million boxes, is down 18 percent from last season’s final utilization — the lowest in the modern history of the citrus industry. At an early stage, infection of fibrous roots by the phloem-associated bacterium Candidatus Liberibacter asiaticus (CLas) reduces fruit size and causes fruit drop. Our research has established that damage of fibrous roots that take up water and nutrients is primarily responsible for the yield loss. This article will provide our latest findings regarding management practices that are most important to sustain root health in Florida citrus groves. Greater HLB symptoms and fruit drop are associated with groves irrigated with water from wells and surface water that contain dissolved bicarbonates or grove soils with a history of dolomite liming to manage high residual soil copper. Irrigation water high in bicarbonates increases soil pH in the wetted area under the microsprinkler, which causes adverse effects on fibrous root functioning, expression of yellow shoots and dieback, premature fruit and leaf drop, and reduced fruit size and yield. In surveys of Ridge and Flatwoods groves, we find a relationship between fibrous root density and reduction in fruit yields for blocks irrigated with water in excess of 100 parts per million (ppm) bicarbonates and soil pH greater than 6.5 in the wetted zone. Yield decline in high-bicarbonate groves is related to water and nutrient stresses associated with lower fibrous root density compared to the non-stress condition. Soil pH depends on the concentration of bicarbonates in the irrigation water, the amount of the water applied, the buffering capacity of the soil and the sensitivity of the rootstock. Figure 1. Soil pH ranges between 5.5 and 6.0 in Ridge groves, four irrigated with low-bicarbonate water (S) without acidification and four irrigated with acidified, high-bicarbonate water, and five Flatwoods groves irrigated with acidified, high-bicarbonate water. 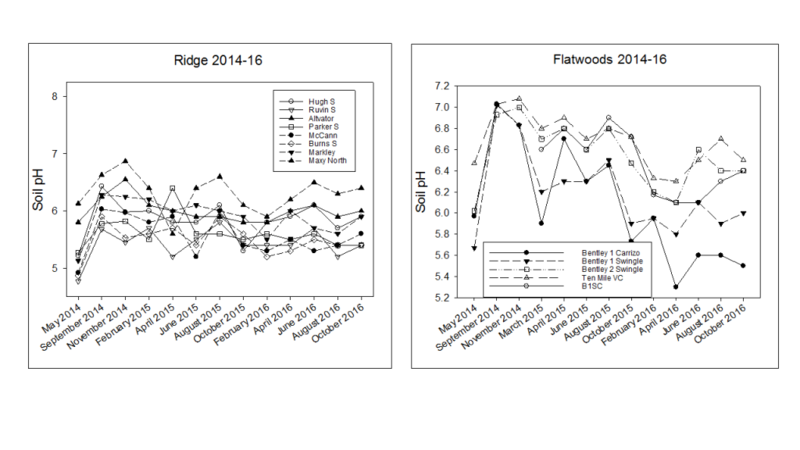 Flatwoods groves maintain a pH range below 6.5, but rise when irrigation frequency decreases during summer–fall rainfall. Figure 2. 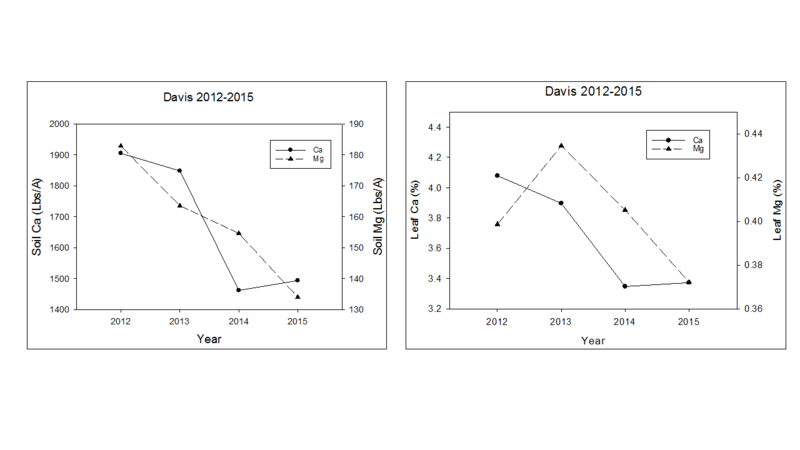 Soil and leaf calcium (Ca) and magnesium (Mg) in Ridge and Flatwoods groves irrigated with acidified water declined from 2012 to 2015. Leaf and soil nutrient analysis of trees in the second year of field trials grown at soil pH from 4.5 to 7.5 demonstrates that higher bicarbonate and soil pH greater than 6.0 reduces availability and uptake of calcium (Ca), magnesium (Mg), iron (Fe), manganese (Mn) and zinc (Zn) — even if soil content is moderate to excessive. Rootstocks also determine severity of HLB symptoms in trees relative to their sensitivity to bicarbonate in greenhouse and field trials. 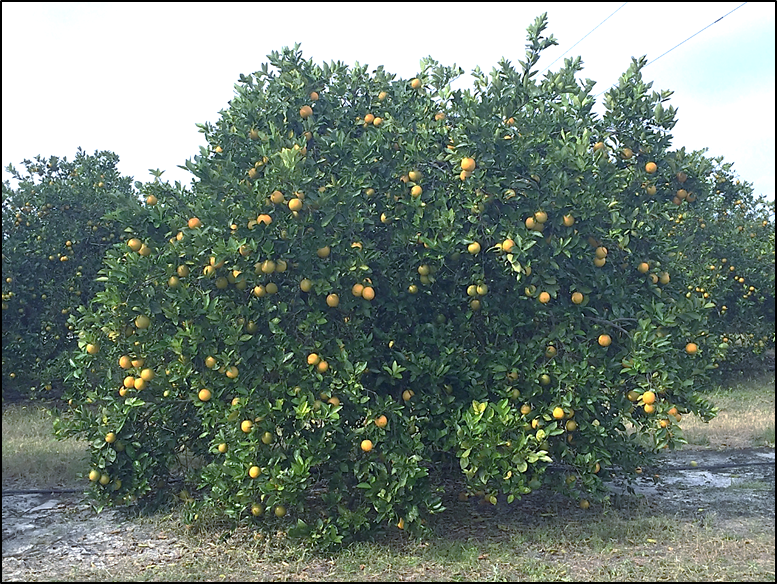 Swingle citrumelo is more sensitive to bicarbonates and more symptomatic in high pH soils than Carrizo citrange, which is more sensitive than sour orange, which displays more symptoms than Cleopatra mandarin. Measurements of grove soils confirm that acidification of the soil directly with sulfur or acidic fertilizers or reduction of soil pH by acidification of irrigation water reduces root zone pH, which increases availability of Ca, Mg, Fe, Mn and Zn for root uptake. Clearly, these nutrients are the most limited in uptake by fibrous roots damaged by CLas infection. Conditioning of irrigation water with sulfuric or N-phuric acid immediately lowers root zone pH, but must be maintained to affect soil pH long term. Conditioning of the soil with elemental sulfur applied to the wetted zone works by releasing acidity for a relatively short period of 30 to 45 days, depending on the soil bicarbonate concentration and the initial pH. Repeated applications of elemental sulfur may be required each year until the soil pH drops below 6.5. Products are available in the market that incorporate sulfur with or without plant nutrients in a clay matrix that releases sulfur and nutrients over a long period of time as the particles dissolve in irrigation water like a slow-release fertilizer. These products have been found to be effective for reducing soil pH and increasing nutrient availability. In central Ridge groves (Highlands County) treated with acidified irrigation water, soil pH has been maintained well below 6.5 (Figure 1). Leaf analysis confirms improved foliar color, and absence of twig dieback is associated with optimum leaf nutrient levels. In Flatwoods groves (Hardee County) with higher bicarbonate in irrigation water, soil pH is in the low 6s during the irrigation season (spring–early summer), but rebounds when irrigation is less frequent in the rainy season. Foliage color and density improves as indicated by leaf analysis. However, after four seasons of acidification in both Ridge and Flatwoods groves, soil and leaf Ca and Mg tend to decline. This indicates there is mining of these nutrients from the soil and less available for uptake by the tree (Figure 2). Annual soil and tissue samples should be used to determine soil Ca and Mg requirements, as well as to follow fluctuations in soil pH. Figure 3. Eight-year-old Valencia Swingle trees after 3.5 years of irrigation water acidification in the Flatwoods (Hardee County, 2016). HLB tree yields on the Flatwoods respond well to acidification treatment of excess bicarbonates in irrigation water (Figure 3), whereas trees grown on Ridge soils do not sustain a recovery in production. For the commercial Flatwoods groves we surveyed, the yield response to acidification is an 83-boxes-per-acre increase, which at $10 per box represents an $830/acre benefit minus $70/acre cost of the acidification treatment for a net profit of $760/acre. Hence, in the Flatwoods, the profit far exceeds the cost of treatment. In contrast, the yield response in the Ridge is a 52-boxes-per-acre decrease, which at $10 per box represents a $520/acre loss. Including the $70-per-acre cost of acidification results in a net loss of $590/acre. The difference between the Flatwoods and Ridge is attributed to higher water and nutrient exchange capacity of Flatwoods soils that provide more favorable water and nutrient availability to the reduced fibrous root zone of HLB trees. In contrast, Ridge soils have half the organic matter and cation exchange capacity of Flatwoods soils and experience more extreme and frequent episodes of water and nutrient stress, especially in the spring and fall when rainfall is in deficit. Therefore, the objective is to increase water and nutrient availability in Ridge soils with more frequent applications of fertilizers containing Ca, Mg, Mn, Zn and Fe. This may be achieved with fertigation mixes or slow-release fertilizers containing supplemental micronutrients along with soil applications of Ca sulfate (gypsum) and Mg sulfate (Epsom salts). To identify bicarbonate stress conditions, check soil pH in the wetted zone and, if in excess of pH 6.5, have your well water tested for pH, bicarbonates, salinity, cations and anions. As indicated above, reduction in soil pH by conditioning irrigation water or soil will increase nutrient availability. Irrigation water conditioning can be achieved by injection of acids (e.g., sulfuric or phosphoric) or combinations of acids and urea to reduce bicarbonates in irrigation water to less than 100 ppm. Injecting products that combine acids and urea reduces the corrosion of injection equipment, makes the acids safer to use and supplies a small amount of nitrogen. Soil conditioning can be achieved by application of sulfur-containing products (other than gypsum, which does not affect soil pH) or application of acidifying fertilizers. Acidification of irrigation water is more effective, but either method of soil pH moderation must be continued until soil tests indicate that the soil is in the proper pH range. We observed that reduction of water/soil bicarbonate stress on roots in Flatwoods groves resulted in a decline in Phytophthora soil populations below the 10 to 20 propagules/cm3 threshold that signals additional root damage by Phytophthora root rot. Hence, correcting abiotic stress on HLB-damaged roots should reduce their susceptibility to further damage by soil pathogens, nematodes and weevil feeding. Replicated trials of acid injection and sulfur application rates were initiated in 2014 and will continue through 2017. These studies will provide additional information on the most effective treatments for water and soil conditioning, provide further evidence for soil conditions contributing to root decline of HLB-affected trees, and hopefully lead to improved root health and yields of HLB-affected trees. Acknowledgement: The authors express their appreciation to Davis Citrus Management for cooperation in the survey of its citrus groves and sharing of soil, nutrient and production data, as well as ALICO and English Brothers Groves for use of their groves. They also thank the Citrus Research and Development Foundation and U.S. Department of Agriculture Multi-Agency Coordination program for funding research efforts. Jim Graham (jhgraham@ufl.edu) is professor emeritus at the Citrus Research and Education Center in Lake Alfred. Kelly Morgan (conserv@ufl.edu) is a professor at the Southwest Florida Research and Education Center in Immokalee.